I’m celebrating 10 years of helping clients to declutter, simplify, organize, and refresh their homes, offices, schedules, and lives! And what’s an anniversary without a bit of reflection and a few selected highlights? What’s an anniversary without a bit of reflection and a few selected highlights? But first I want to thank you all — friends, family, colleagues, clients (especially clients), business networking contacts, joint venture partners, assistants, newsletter subscribers, blog readers, and social media followers — for the support you have given me during this first decade of my solopreneur roller coaster ride! 2005 – Founded my company, Organized For Life. Created first website, and started monthly newsletter, Org4life News. Volunteered briefly as NAPO-LA chapter librarian. 10 years ago. Really, is that all? I look so young! 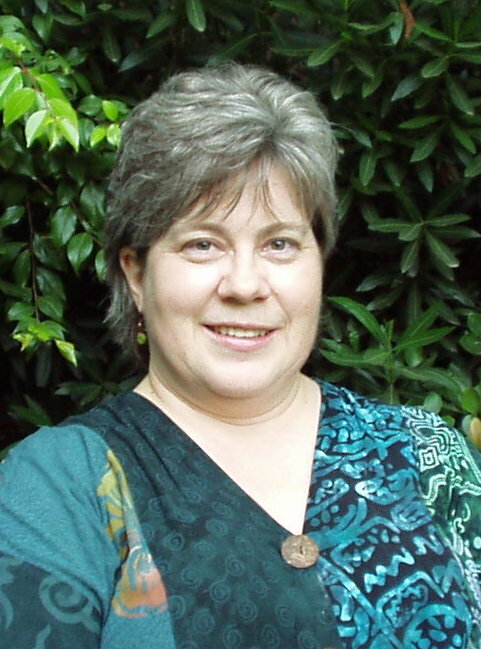 2005 – Attended NAPO2005 Conference in San Diego. 2007 – Earned IRIS certification in Home Staging and Interior Redesign. 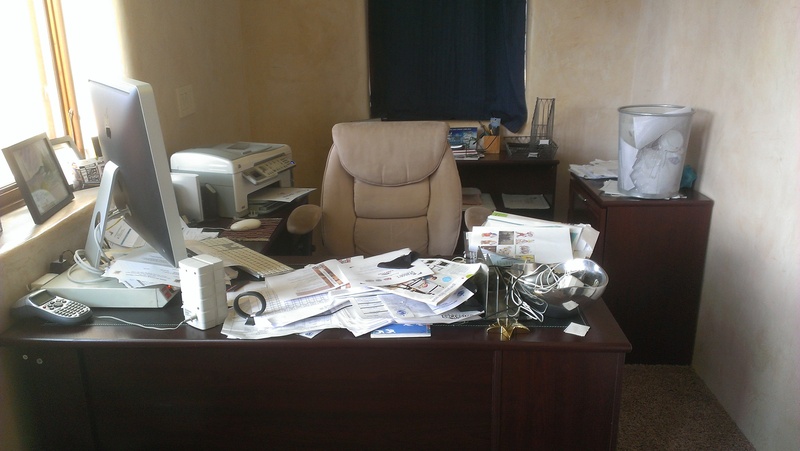 BEFORE: Corporate-looking and boring. Apparently my newsletter was only quarterly in the beginning. 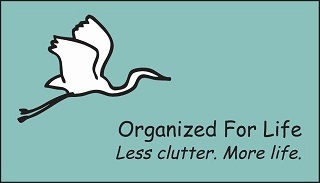 AFTER: Doesn’t this make you want to rise above your clutter and find the freedom of getting Organized For Life? 2010 – Accepted into NAPO’s Golden Circle. 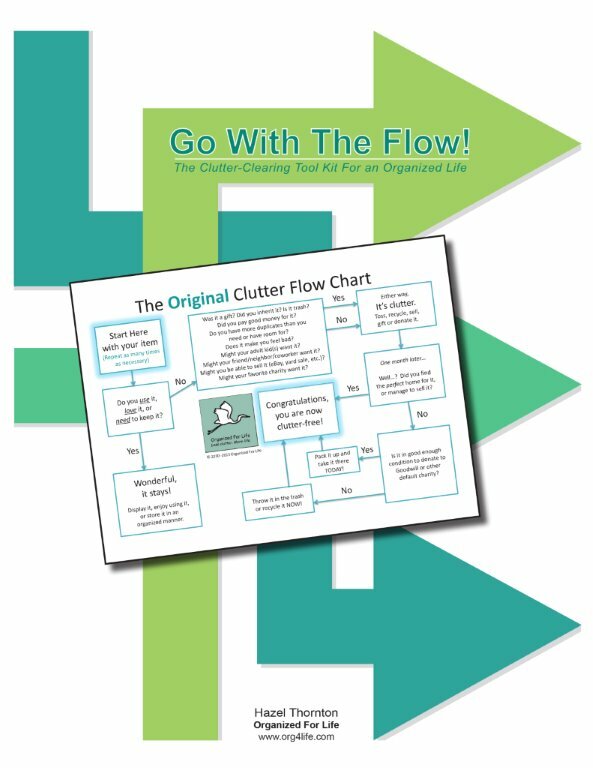 2011 – Started offering Custom-Branded Clutter Flow Charts to other professional organizers for use with their own clients and marketing prospects. 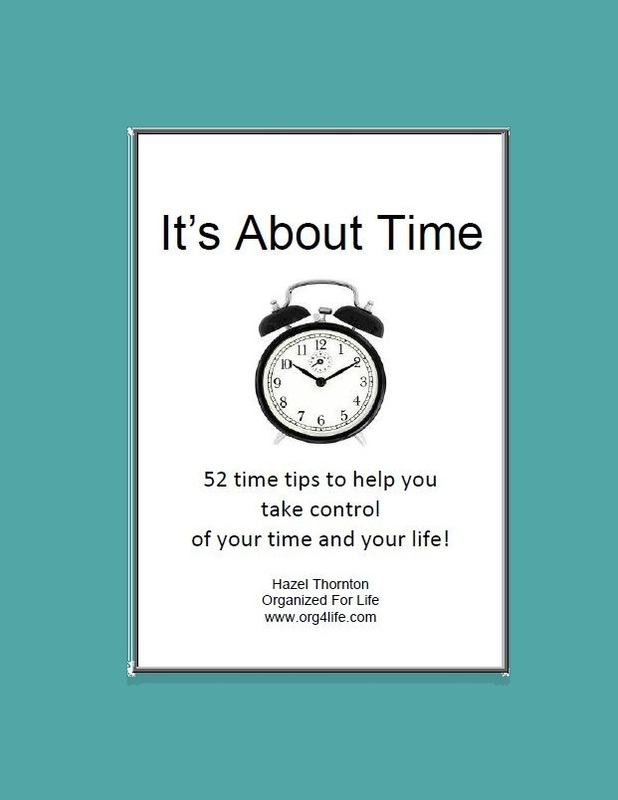 2011 – Compiled the previous year’s weekly Facebook time tips into an indexed and cross-referenced e-book, It’s About Time: 52 tips to help you take control of your time and your life! 2012 – Attended NAPO 2012 Conference in Baltimore. 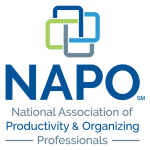 2013 – Attended the NAPO2013 conference in New Orleans. 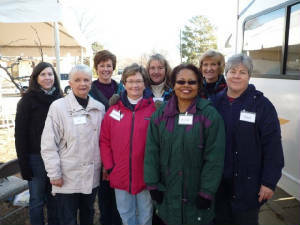 2013 – Joined the NAPO Virtual Chapter and served as their Secretary for a year. 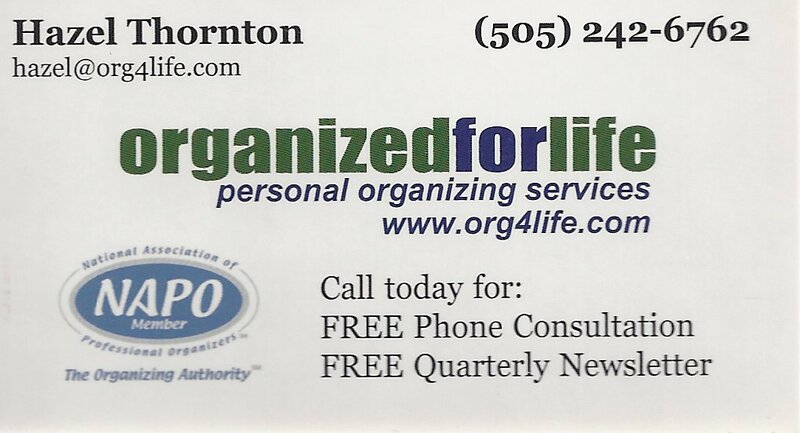 2013 – Added DIY Organizing section to website. 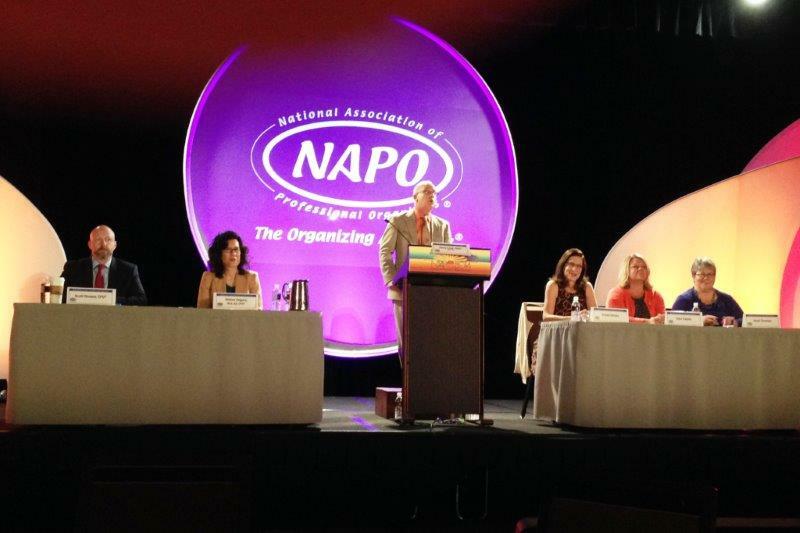 2014 – Participated on the Ask the Organizers Golden Circle Panel at the NAPO2014 conference in Scottsdale. 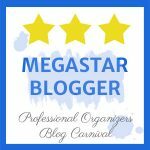 2014 – Designated as a Superstar Blogger on the Professional Organizers Blog Carnival. 2014 – Joined the NAPO Authorship and Publishing SIG (Special Interest Group). 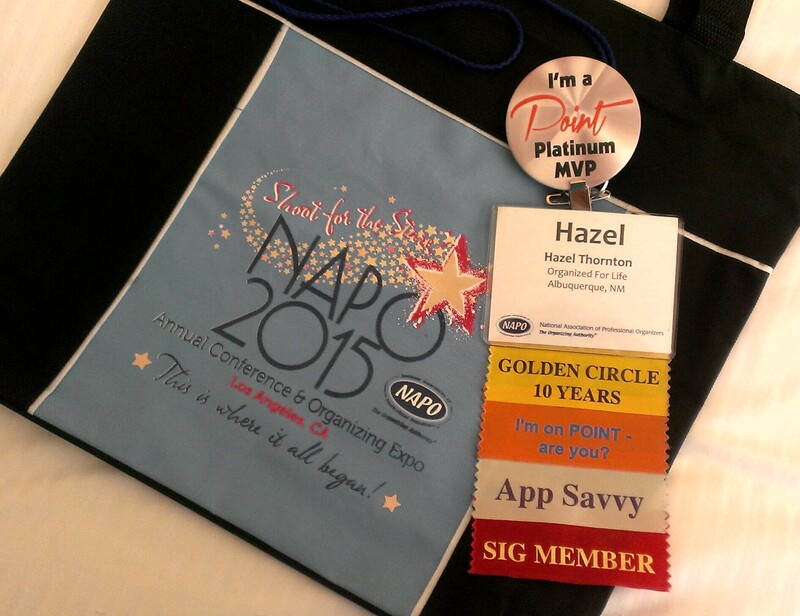 2015 – Recognized as a Point Platinum MVP at the NAPO2015 Conference in Los Angeles. Not listed: Clients helped, classes taken, books read, presentations given, hours donated, networking accomplished, and friendships forged. Plans for the near future: Offer specific Virtual Services to those who do not live nearby; to DIY types who just need a little coaching; to those who prefer their privacy; and to those who cannot afford multiple hands-on organizing sessions. Virtual Services will include Home & Office Organizing, Time Management Consulting and Coaching, and possibly Digital Photo Organizing. 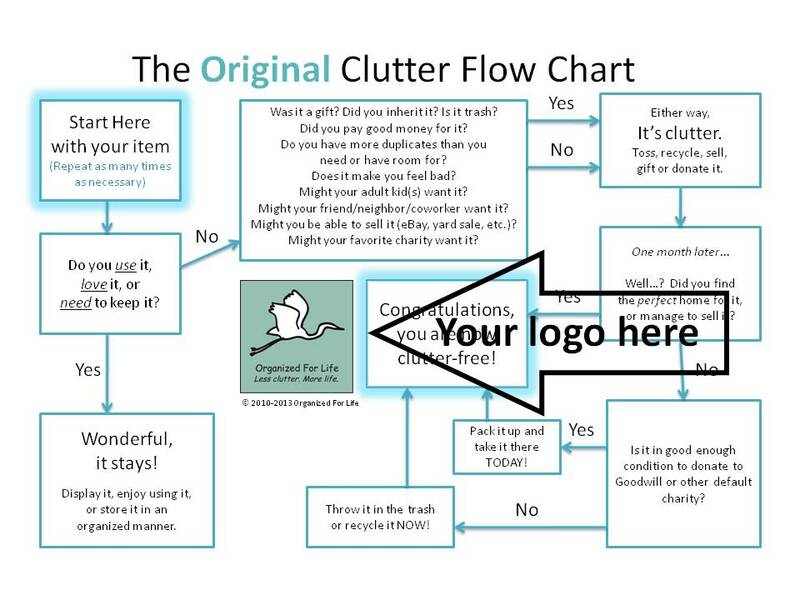 All clients will have access to Clutter Flow Charts specific to their situation. The charts were, after all, designed to help clients declutter when I’m not right there by their sides! I welcome all of your comments, questions, and suggestions. Please leave a comment below, or contact me. Hazel, you did a great job of presenting ten years in a concise, readable history! Can you imagine how long it would be if you listed every book, class, and client? Congratulations on your first ten years, and I wish you many more years of success! Thanks, Janet! You are one of my top helpers and supporters and I couldn’t have done it without you! You’ve been busy friend. Congratulations on your recovery from the phone factory. Be well, enjoy the day, and stay cool. Thanks, Jerry! It was great to reconnect with some of my phone company friends when I was in LA this spring. Also glad we’re Facebook friends! Congratulations! What a well organized summary of a busy 10 years. I wish you all the best for another 10+ years of fun and profits! Congratulations on your first 10 years and all your amazing accomplishments! You are so loved and respected in our industry and knowing you has truly enriched my life! Hugs! Like Janet said, concise and to the point, congratulations and may it continue. Kudos to you, Hazel! What a neat walk down memory lane. You have so much to be proud of and are truly a role model for newbies like me! Thanks, Sarah! That means a lot to me. I really enjoyed reading about your organizing journey, and all the many steps you’ve taken to keep your business evolving and moving forward. I remember listening to you on the panel in Scottsdale – it was fun to see you “live” after our social media interactions:) Congratulations on 10 years, Hazel, and may you have many more successful years ahead! Congrats on 10 years!!! What a huge accomplishment, it was really fun to see and hear about all those milestones! Here’s to the next 10!